Treason is a betrayal of trust. 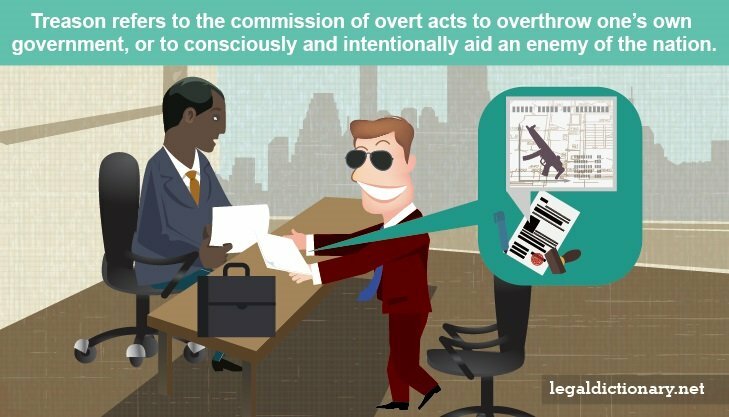 In a legal sense, the term refers to the commission of overt acts to overthrow one’s own government, or to consciously and intentionally aid an enemy of the nation. The crime of treason is addressed in Article III, Section 3, of the U.S. Constitution, though its definition today is somewhat more broad. To explore this concept, consider the following treason definition. Throughout history, and in every corner of the earth, treason has been considered a most vile crime. In fact, the road through time has been littered with accounts of traitorous men turning on family, God, and country. When Judas Iscariot committed his infamous act of treachery in handing over his beloved Savior to the chief priests of the Jewish faith, his very name became synonymous with the terms treason and traitor. The Constitution describes the levying of war against the United states as a treasonous act. It also states that giving “aid and comfort” to the nation’s enemies is considered treason. Aid and comfort can take many forms, though they include such acts as providing troops, weapons, transportation, or shelter to an enemy of the nation. This also refers to providing classified or sensitive information to an enemy of the U.S. In short, engaging in any act that weakens the might of the United States, is considered to be providing aid and comfort. The Constitution is specific, however, that the Treason clause can only be applied for acts committed during times of war. While certain acts committed during peacetime may be illegal, they would not be considered treason, according to the Constitution’s definition. In 1946, Andrei is caught selling both classified information and weapons to the Soviet Union. He is put on trial in 1947, and convicted of both crimes, though he was not charged with treason because the prosecution could not prove Andrei’s actions prior to the end of WWII in 1945. In this example of treason, not only were the U.S. and U.S.S.R. allies during the Great War, but the U.S. was no longer in a state of war during the period for which he was convicted. The levying of war, which is to advance or further the cause of war or rebellion, does not require one to take up arms and fight. Rather, anyone assisting, or conspiring with, another in such acts has engaged in the illegal act. Such a person may be tried for treason if an armed conflict or rebellion occurs as a result. By this definition, every single Confederate soldier who participated in the Civil War was guilty of treason. They were not charged, however, because President Johnson declared amnesty for all. Because of the very serious nature of charges of treason, the Constitution requires that a least two people bear witness to the same treasonous act. This requirement minimizes the opportunity of a witch hunt against someone by an individual enemy or adversary. The two-witness requirement is put aside if the perpetrator confesses his treasonous acts in open court. The act of treason requires the individual have the intent to commit the traitorous act. This is similar to other serious crimes, such as first degree murder, in which the perpetrator must have intended to engage in the act. By this definition, someone who inadvertently aids an enemy of the United States during wartime has not committed treason. The Constitution specifically addresses the issue of allegiance in treason, stating that a person “… owing allegiance to the United States …” may be subject to charges of treason for certain acts. Allegiance refers to a loyalty owed to one’s government. In the United States, one need not be a citizen of the U.S. to owe an allegiance for the purposes of charges of treason. People can owe a temporary allegiance to the U.S. government, even if they are aliens, during the time that they live in the U.S. Also, treasonous acts need not be committed on U.S. soil to be charged and punished as treason. English common law took treason to the crown very seriously, assigning the penalty of death by beheading, after the traitor had been drawn and quartered. Modern law still views treason against the U.S. government with a harsh eye, though torture has never been a valid punishment on U.S. soil. According to the Constitution, Congress has the authority to set punishment for treason, though it cannot impose penalties beyond the traitor’s life. This is specified because, in historic England, someone convicted of treason was considered to be dead to the eyes of the law, thus nullifying his claim to personal and real property, even to the detriment of his descendants. In the United States, Congress has no such power, though it may sentence a traitor to the death penalty. In 1916, a baby girl was born to two Japanese immigrants, in Los Angeles, California. This little girl, Ikuko Toguri, grew up and attended college at UCLA, graduating in 1940 with a degree in zoology. At the age of 25, Toguri traveled to Japan, where she ultimately decided to remain after the U.S. declaration of war against Japan. When the war started, Toguri was pressured by the Japanese government to denounce her U.S. citizenship, but she refused, becoming an enemy alien, and denied a war ration card. With a need to support herself, Toguri took a job as a typist at Radio Tokyo. She was later asked to broadcast a daily show designed to demoralize the American troops. It was those very troops who gave her the nickname of “Tokyo Rose.” Within a year, Toguri’s smooth voice and delivery of oddly annoying banter had earned her a spot as a top-rated broadcaster, with a substantial salary. Throughout the war, Toguri never renounced her U.S. citizenship. Once U.S. authorities discovered the true identity of Tokyo Rose, she was detained and escorted back to the U.S. by military guard in 1948. The FBI immediately arrested her on charges of treason. On July 5, 1949, Tokyo Rose became the seventh person convicted of treason in the United States. She was sentenced to 10 years in prison, and fined $10,000. Toguri was released from prison after serving only 6 years of her 10-year sentence. The case for treason against Tokyo Rose was troubled from the outset, beginning with difficulty obtaining an indictment from a grand jury. An investigation conducted by a Chicago Tribune reporter in 1976 turned up a conspiracy in which the two primary witnesses at Toguri’s trial had lied on the stand. Both told the reporter that the FBI and other federal authorities had spent two months coaching them about what they should say during the trial, going so far as to threaten them with charges of treason as well if they didn’t cooperate. On his last day in office, President Gerald Ford pardoned Toguri, based on the problems with the indictment, trial, and conviction. The pardon, which came just over 20 years after Toguri’s conviction, restored her U.S. citizenship. Witness – An individual who can provide a firsthand account of something heard, seen, or experienced.